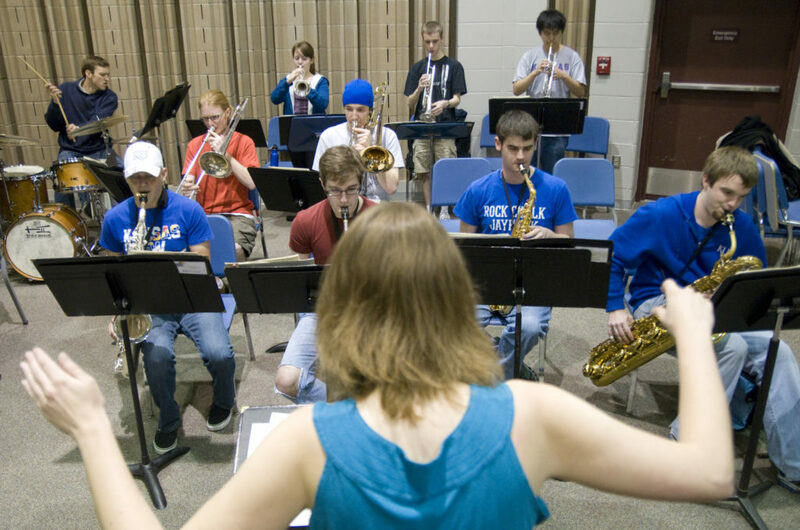 Mary Huntimer, graduate teaching assistant at Kansas University, directs students in the KU Jazz Ensemble III class rehearsal of “Blues Du Jour” on Friday in Murphy Hall. 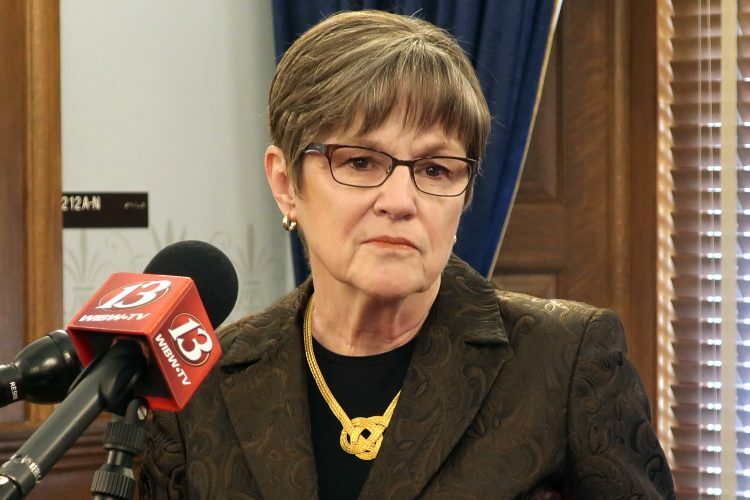 The state’s revenue forecast was revised downward on Friday by nearly 30 million, and lawmakers will have to make further budget cuts or other adjustments when they return for their wrap-up session later this month. Education and social services may have to tighten their belts even more if Republicans have their way. 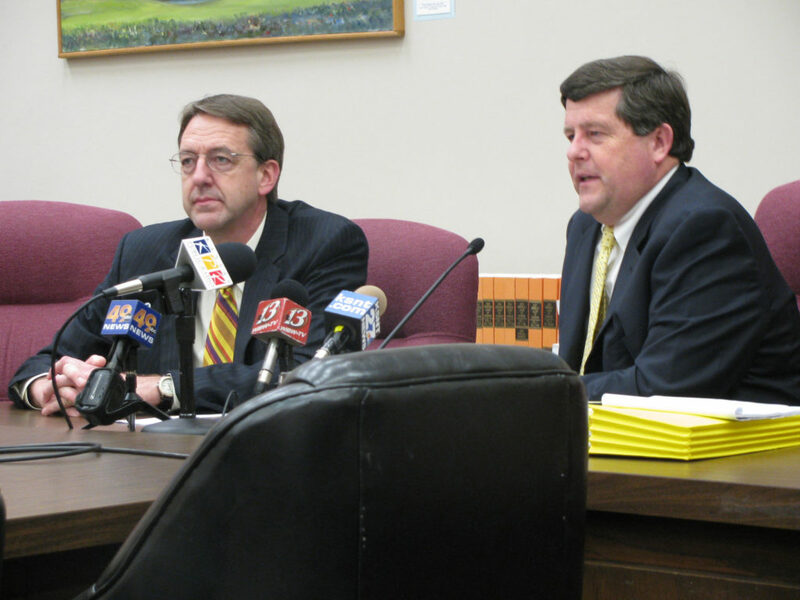 Duane Goossen, left, Gov. 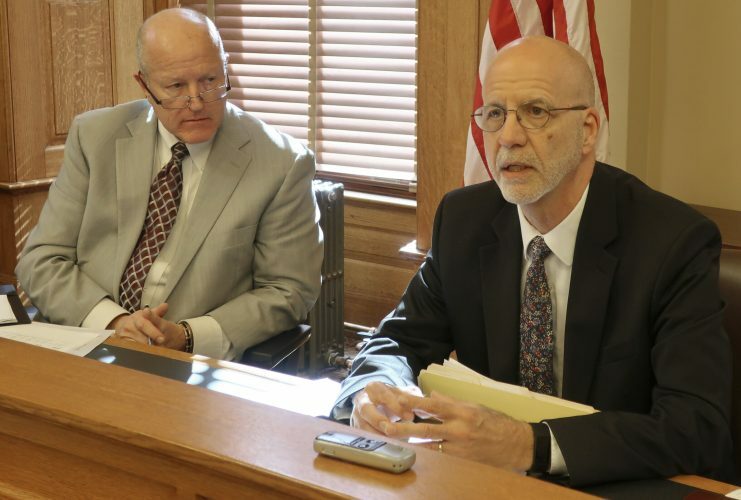 Kathleen Sebelius’ budget director, and Alan Conroy, director of the Kansas Legislative Research Department, explain the latest revenue estimate for the state budget. The news wasn’t good: Revenue estimates were revised downward 28 million. Topeka ? 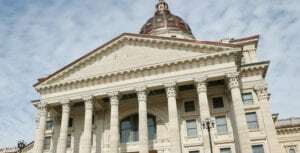 Not even implemented yet, the state budget approved two weeks ago is nearly $330 million in the red, reflecting a Kansas economy that is breaking records for joblessness and “negative” growth, officials said Friday. 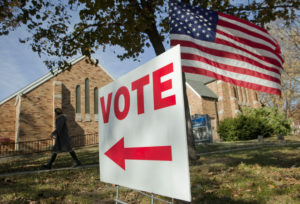 “The overall economic outlook clearly reflects … unfortunately that sort of perfect storm of almost every economic indicator going the wrong, wrong way,” said Alan Conroy, director of the Kansas Legislative Research Department. 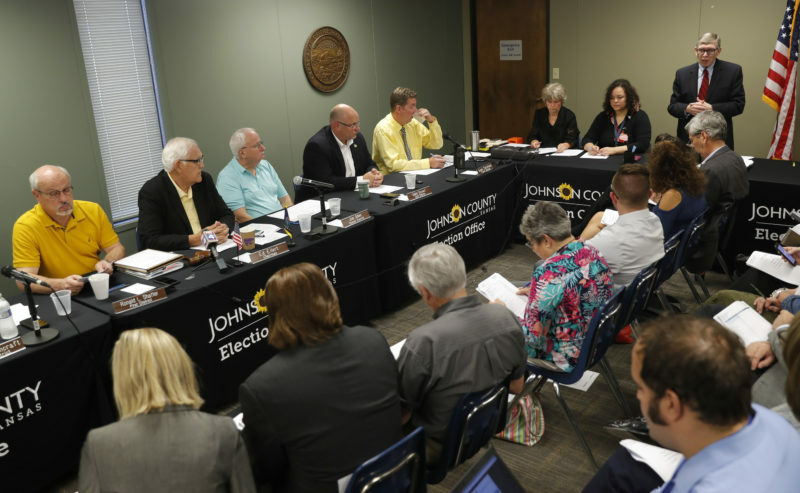 Conroy and budget experts emerged from a closed-door meeting of the Consensus Revenue Estimating Group to reset state revenue expectations for the 2010 fiscal year, which starts July 1. The $13 billion budget recently approved by lawmakers and signed by Gov. Kathleen Sebelius will be $328 million out of whack because of falling tax revenues, the group said. The downward revision was of “historic proportions” since the revenue estimating group started in 1975, Conroy said. He said the numbers reflect the current recession. For the first time since World War II, personal income growth and state gross domestic product will be negative in 2009, he said. Unemployment for March was 6.5 percent, the highest it has been in Kansas since 1983. For lawmakers returning for the wrap-up session April 29, the choices are not good — more budget cuts, tax increases, bookkeeping tricks or all of the above. Sebelius urged the Legislature to enact her earlier recommendations delaying the phaseout of several taxes, sweeping funds headed to local governments, and banking on casino development fees. “Now, with the official projection that our revenues leave a deficit gap of $328 million, I hope the Legislature enacts my recommendations before they propose more cuts in essential services for vulnerable citizens or further cuts in education,” Sebelius said. But Republicans who dominate the Legislature have been cool to any idea that could be considered a tax increase or delay of a tax cut. But House Democratic Leader Paul Davis of Lawrence said suspension of tax phaseouts had to be considered because of the cuts already made in the budget to public schools, social services and higher education. “It’s time for everyone to share in the sacrifice brought on by the financial crisis, not just our vulnerable citizens,” he said. If the deficit were made up with cuts alone, that would be a 5.7 percent cut, on top of cuts that already have been instituted. But even if all of Sebelius’ recommendations were approved, that would produce only $180 million — leaving nearly $150 million of further adjustments. Another $77 million could be gained by the state if it “decoupled” its tax code from recent federal tax breaks. Another wrinkle in the process is that Sebelius may be gone when the wrap-up session starts. She has been nominated by President Barack Obama to serve as secretary of the Department of Health and Human Services, and may be confirmed next week. Asked about that, Goossen said that shouldn’t produce any problems because Lt. Gov. Mark Parkinson, who would replace Sebelius, has been engaged in the budget process. “If the governor is confirmed in Washington, and goes there, we will have a new governor,” he said.